Nationality: Hungarian. Born: Budapest, 19 September 1931. Education: VGIK (Film School), Moscow, 1957. Family: Married 1) first husband (name unkown), (divorced) 1959; 2) director Miklós Jancsó (divorced); 3) actor Jan Nowicki. Career: Immigrated with family to USSR, 1936; returned to Hungary, 1946; worked at Newsreel Studio, Budapest, 1954; worked for the Alexandru Sahia documentary studio, Bucharest, Romania, 1957–59; made science popularization shorts and documentary shorts, Budapest, 1959–68; joined Mafilm Group 4, mid-1960s; directed first feature, 1968. Awards: Golden Bear, Berlin Film Festival, for Adoption , 1975; FIPRESCI Prize, Cannes Film Festival, for Nine Months , 1976; Special Jury Grand Prize, Cannes Film Festival, for Diary for My Children , 1984; Golden Frog, Camerimage and OCIC Award, Venice Film Festival, both for The Seventh Room , 1995. Agent: c/o Hungarofilm, Bathory utca 10, H-1054 Budapest, Hungary. Interviews in Filmkultura (Budapest), November/December 1972 and March/April 1977. Interview in Hungarofilm Bulletin (Budapest), no. 2, 1977. Interview with T. Giraud and D. Villain, in Cahiers du Cinéma (Paris), January 1978. Interview with C. Clouzot and others, in Ecran (Paris), 15 January 1979. Interview with L. Bonneville, in Séquences (Montreal), September 1988. Interview with A. Troshin, in Film und Fernsehen (Berlin), vol. 18, no. 9, 1990. Portuges, Catherine, Screen Memories: The Hungarian Cinema of Márta Mészáros , Bloomington, Indiana, 1993. Elley, Derek, "Hiding It under a Bushel: Breaking Free," in Films and Filming (London), February 1974. Elley, Derek, "Márta Mészáros," in International Film Guide 1979 , London, 1978. Martineau, B.H., "The Films of Marta Mészáros, or, the Importance of Being Banal," in Film Quarterly (Berkeley), Fall 1980. "Hungarian Film Section" of Filmfaust (Frankfurt), January/February 1984. "Diary for My Loves," in Hungarofilm Bulletin (Budapest), no. 2, 1987. Portuges, C., "Retrospective Narratives in Hungarian Cinema: The 1980s 'Diary' Trilogy of Marta Meszaros," in Velvet Light Trap (Austin, Texas), Spring 1991. Quart, B., "Three Central European Women Directors Revisited," in Cineaste (New York), no. 4, 1993. Waller, Marguerite R., "Fetus," in American Historical Review , October 1994. Dixon, Wheeler Winston, "A Personal/Political Artist: Marta Meszaros," in Literature-Film Quarterly (Salisbury, Maryland), October 1995. Márta Mészáros is one of few contemporary woman filmmakers consistently making films both critically and commercially successful for an international audience. 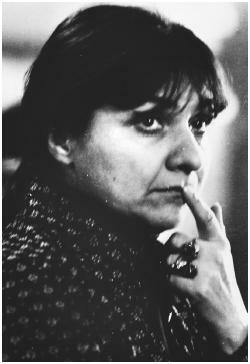 Her eight feature films made from 1968 to 1979 are concerned with the social oppression, economic constraints, and emotional challenges faced by Hungarian women. Mészáros explains: "I tell banal, commonplace stories, and then in them the leads are women—I portray things from a woman's angle." Trained in filmmaking on a scholarship at Moscow's film school, she worked at Newsreel Studios in Budapest, made four short films at the Bucharest Documentary Studios, married a Romanian citizen in 1957, and was divorced in 1959. She returned to Budapest, where she made more than 30 documentaries before attempting a feature. Mészáros's documentaries deal with subjects as diverse as science ( Mass Production of Eggs ), a Hungarian hero ( Saturday, July 27th, 1963 ), orphans ( Care and Affection ), and artists ( Szentendre—Town of Painters , which she considers her best documentary). In the mid-1960s Mészáros joined Mafilm Group 4, where she met Miklós Jancsó, whom she later married. She wrote and directed her first feature, The Girl , in 1968. A hopeless mood pervades this story of the quest by an orphan girl for her biological parents, who had abandoned her. The girl leaves her textile factory job to comfort her mother, who introduces her as her niece to her husband and relatives. The girl meets a man whom she believes is her father. The man neither confirms nor denies this. The girl returns home and attends a factory dance where she meets a young man who is interested in her. As with most Mészáros features the film is open-ended, lacking a conventional plot. Dialogue is sparse. Derek Elley asserts that The Girl is a model to which Mészáros adheres in her subsequent features; her visual compositions are "carefully composed, rarely showy," and "characterisation never remains static." In Binding Sentiments the conflicts between an aging mother and her son's fiancée are delineated with understated solemnity and subtle humor. A semi-musical, Don't Cry, Pretty Girls , lightheartedly captures the romance between a rural girl and a city musician in a hostel and youth camp setting. Mészáros's short Woman in the Spinnery studies the working status and conditions of the factory worker, the same subjects that she explores in Riddance. In this generation gap tale, a pair of lovers must deceive the young man's parents, who object to his love for a girl who was raised in a children's home with no family. Riddance urges assertiveness and truth to oneself, and shows little sympathy for the older generation. A fortyish woman wants a child from her unmarried lover in Adoption. She meets a teenager raised by the state who wants to marry her boyfriend. The relationship which develops between these two women and the man in their lives becomes the subject of Mészáros's most illuminating work. A factory woman with one child has an affair with an engineer in Nine Months. The conflicts in their relationship are never resolved; they cannot agree on the terms and conditions of a life together; neither can surrender enough self to form a partnership. The woman leaves him to bear her second child alone. The actual birth of Lila Monari's child was photographed for the film. The aptly titled Two Women depicts a friendship. Juli has a daughter and a husband attempting to find a cure for his alcoholism. Mari directs a hostel for working women, and tolerates a lackluster husband. Juli and Mari enjoy a greater rapport with each other than with the men in their lives. Situations depicting humiliation of and discrimination against women recur. The subject of Mészáros's next film, about a young man's attraction to a little girl, makes Just like at Home a departure from her focus on women. In this film, Andras returns to Budapest after study in the U.S. and strikes up a friendship with a ten-year-old Zsuzsi, whose parents agree that she live with Andras in Budapest and be educated there. Their chaste friendship endures despite the intrusion of Andras's lady friend. Andras learns more from Zsuzsi than she learns from him, to the bewilderment of their parents. In The Heiresses Mészáros used a period setting for the first time. A young, sterile woman marries a military officer during the World War II era. Because she needs an heir to inherit her father's money, she persuades a Jewish woman to bear a child sired by her husband. After the birth, the woman and her husband become deeply attached, and a second child is born. Then the wife "turns in" the Jewish woman (Jews were deported from Hungary in 1944), the husband is arrested, and the wife is given custody of the second child. The semi-autobiographical "diary" series of films include Diary for My Children, Diary for My Loves, Diary for My Father and My Mother , and, last in the series, the prequel, Little Vilma: The Last Diary. In these films, Mészáros continues her quest to link the personal with the political by showing world events through the eyes of the women living through them. Though critics often call Diary for My Children the best of the group and many complain that the films grow weaker and blander with each installment, the diary series represents Mészáros's mostly deeply felt political dissent. The films follow the traumatic effects of Stalinism on Mészáros and her family. Especially in Little Vilma , which is both the last and the first film, seesawing from past to present, Mészáros explores the wide and often tragic gaps between ideals and realities, and between parents and their children. Mészáros's films deal with realities usually ignored in Eastern European cinema: the subordination of women, conflicts of urban and rural cultures, antagonism between the bureaucracy and its employees, alcoholism, the generation gap, dissolution of traditional family structures, and the plight of state-reared children. In her unpretentious works, she creates a composite picture of life in Hungary today. In Derek Elley's words, she "has created a body of feature work which, for sheer thematic and stylistic homogeneity, ranks among the best in current world cinema." Her features examine emotional struggles "in the search for human warmth and companionship in a present-day, industrialised society."